GOLDEN HEART BLESSING MEDITATION: In this meditation we are going to BLESS each and every possible person, thing, emotion, feeling, place, relationship, a body as the whole and its parts and whatever comes to our mind along with these with our VK by sending the GOLDEN energy to these areas. In this THE GOLDEN HEART BLESSING MEDITATION with VIBBES KADA (VK) we have to feel our HEART filled with GOLDEN light. This GOLDEN light is the purest DIVINE light. It is a shining and a bright light of DIVINE. This GOLDEN light makes our meditations powerful and more effective. This limitless and infinite GOLDEN light will enhance our own purity levels. This GOLDEN light can increase our present BLESSINGS to trillion folds and harmonize our all aspects of life to its best. In this THE GOLDEN HEART BLESSING MEDITATION we can not only BLESS our soul, mind, body, happy emotions, wow feelings, positive thoughts, health, wealth, abundance, prosperity, blessings, and achievements and increase them to trillion folds but also our problem areas like our broken relationships either with spouse, parents, children, and friends. Unhealthy body parts like damaged liver, non-functioning kidney, fatty liver, broken bone, diabetic issues, and Blood pressure levels. Money issues like debts or loans. Stagnant work areas, offices, and factories. Fearful situations. Scary enemies. Troublesome children including their studies, sleeping, eating routines. Emotions like sadness, jealousy, envy, grief, anger, fear, distrust and many more. Our thinking pattern to choose positive out of both negative and positive thoughts. Our material possessions like a car, home, gadgets and many more things with more and more of GOLDEN ENERGY. All we have to do is find ourselves a comfortable and peaceful space to lie down after our day long activities. Find time to connect to the DIVINE this way. Take 3 to 5 deep breaths. Place your hands wherever you are comfortable. Place your VK right in the center of your Chest. Now start sending blessings one by one. Bless every area at-least 3 times but where situations are going tough spent more time there and bless more than 3 times there. I Bless My Exercise Routine. Above are few examples. You can bless as many as you wish. These and many more BLESSINGS can be requested to Divine in your THE GOLDEN HEART BLESSING MEDIATION. Where there is no limit to our blessings and wishes. Where the universe is INFINITE to BLESS us all we want. Where VK is our medium to get connected to the DIVINE with supersonic speed. Where our BLESSINGS will be multiplied in trillion folds with our THE GOLDEN HEART BLESSING MEDITATION. Please make sure that we have to follow our inner guidance to send the energy to any and all areas we think of or it comes to our mind on its own. Keep sending the energy wherever its guidance comes to you. Specially the problem areas either it is health, wealth, mind, body, feelings, emotions, thoughts or anything else. Both sender and receiver get all the benefits of this meditation. Those who regularly do this meditation, his/her Soul will automatically reach in Ascension Mode. Every time we bless in this GOLDEN HEART BLESSING MEDITATION, all the possible unwanted and negative energies will vanish from blessed areas and all possible good and harmonized energies will instantly increase with the speed of light at blessed areas. GOLDEN HEART BLESSING MEDITATION can remove all the unwanted and negative energies from the blessed areas and situations. Keep doing this GOLDEN HEART BLESSING MEDITATION regularly to attain best possible life. Some people have habitual negative thought pattern, they try their best but many times fail to choose positive. If a blessing is given by such a person it would never reach the receiver or reach with low frequency. But VIBBES KADA has cosmic energies and it can work beyond the human’s basic nature. It can send the energy with a pure level. Blessings sent with VK placed in the centre of chest reaches to the receiver in many multi folds. The blessing actually works when it is aligned with VK. The cosmic energies in VIBBES KADA are so powerful and speedy that they reach the beneficiaries at a very fast speed with higher frequencies. As you see in the image (Cosmic Energy Ripples Image) the cosmic energies travel in such a way that it creates ripples in the heart of a person. These ripples keep you in auto healing mode. And this auto healing mode heals and releases all grief, sadness, old fears, trauma and phobias from your energy system to obtain real blissful life. And thus helps in sending real blessing from your heart. The receiver receives the true blessings from you when you use VIBBES KADA, as it has cosmic energies which have intense powers to help you forgive a person and heal your relationship with the person. Relationships can improve when blessings send with VIBBES KADA as those would be pure feelings of the person. According to the law of GIVING/ law of attraction/ law of nature, we get what we give, so when we give pure blessings we get the same blessings back. Not only can we bless humans but we feel powerful to bless each and every atom including animals, plants and other objects of the earth when blessings are sent with VIBBES KADA as it is much more powerful than a human’s his own feelings. VIBBES KADA is attuned in such a way that it can send ONLY good energy and activate on ONLY good intention. Even if a human cannot feel good and send blessing for LONG, VIBBES KADA can send strong and pure blessing to the beneficiary even on a small single pure intention. VIBBES KADA keeps you raised up with cosmic energies and positive enough to send blessings to not only your loved ones but also to people who hate you or are jealous of you or hurt you. Gratitude to Divine for GOLDEN SUNRISE to live a blessed life. WE bless all with loads of love and care. WE bless all with good health and active life. WE bless all with more opportunities to prosper. WE bless all with enthusiasm at work. WE bless all with determination to fulfil their wishes. WE bless all with patience in the journey of life. WE bless all with success and learning at each step. Gratitude to #SharatSir for GOLDEN HEART BLESSINGS MEDITATION with VK. Gratitude to Divine for infinite blessings in our lives. 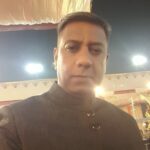 GOLDEN SUNRISE Sharat Sir, Indeed this is more than I thought possible as I use a phrase in Access Consciousness – How does it get any better than this and what else is possible that I never even considered? Well, This quenched my Soul to the fullest. Much, Much Appreciation and Thank You for all You do. Up, Up with Magnanimousness! Golden Sunrise Sir. Thank you for this wonderful article and blessing way. My review of VIBBES KADA with GOLDEN HEART BLESSING MEDITATION. What a brilliant way to bless and help others. My personal experience of blessing a young person who was struggling to get a desired job for more than a year ……gave wonderful results. Blessing the soul and its talent ,intelligence ,capabilities, thoughts , earnings and career in Golden heart mediation daily for few weeks enhancing the blessings trillion times by requesting to VIBBES KADA. The result was….the person got an opportunity….cleared a series of interview and finally got the desired job profile in a reputed organisation. Wow. Blessings always work, but Vibbes Kada enhanced the blessings and showed the effect so fast. Thank you Sharat Sir.Today I recieved VK.I did meditation as described.Feeling great. indeed this is great meditation, one issue which was not changing has changed for the better with it. Thanks Sir for this beautiful and most effective meditation known to me till date. Thanks a ton! Golden Sunrise Sir. Thank you for this beautiful gift. Started seeing changes through blessings…….. Thanks a ton Sir for explaning this in a very simple and easy way. Thanks for your thanks Hitesh and Renu. Great meditation shared sir, thanks for this beautiful gift! For this very beauty full and valuable meditation knowledge. Each n everything in our lives needs blessings… To be happy, healthy, wealthy n to prosper..